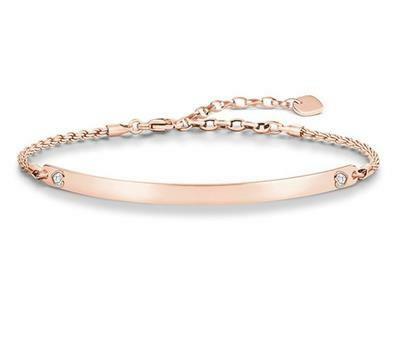 This elegant bracelet by Thomas Sabo is part of the engravable Love Bridge collection, and is made from 18ct Rose Gold. The bridge features a sweet heart motif with Cubic Zirconia detail, making this the ultimate personal gift for the one you love. Let us know what you'd like engraved in the special comments box at checkout. This style can be engraved with up to 18 characters. This bracelet is 19.5cm in length.